We are puzzle people (or rather, my sons are.) We have about a dozen wooden puzzles for small children that seem to always be missing one piece. Just one. While we do find them all eventually, and I have a nice rack for the puzzles to go on, someone always fails to put them back in a timely manner, and one puzzle piece remains under the couch, in a random drawer, or chewed up by the dog. The Mom behind the Puzzle Pod had her thinking cap on when she thought up this obvious, simple, but much-needed solution to puzzle containment. 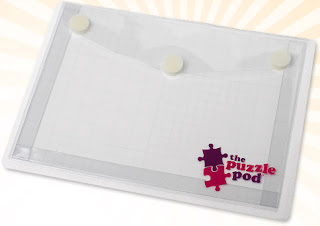 It is a simple vinyl envelope that sticks to the back of a puzzle tray, and it seals shut with velcro tabs. Kids old enough to do a puzzle can just as easily put all the pieces into the Puzzle Pod when they are done. No more missing pieces. I love that the material it's made from is sturdy. It won't be ripping after a few uses, like some other organizational products. It is also very forgiving to the amount of items you place into it. We have one Melissa and Doug puzzle with very chunky pieces. I was worried that the entire set of pieces wouldn't fit into the Puzzle Pod and still be able to close, but I was wrong! Look for The Puzzle Pod online at www.ThePuzzlePod.com. *Sample was received for this review. Opinions are my own.